The Maxwell's Black Weaver was formally described by Jose Vicente Barbosa du Bocage, a Portuguese zoologist and politician. He was curator of the Lisbon Museum. Richard Bowdler Sharpe, an English zoologist, obtained the Maxwell's Black Weaver specimen from Henry Whitely, a British dealer in bird skins living at 28 Wellington Street, Woolwich. His son, also Henry Whitely, travelled in Japan and South America to collect bird specimens. It is not known from whom Whitely (senior) obtained the Maxwell's Black Weaver specimen. Dowsett-Lemaire & Dowsett (2014) suggested that the specimen was from Ghana. Sharpe sent a collection of birds (mostly from Quanza, Angola) to Bocage who was interested in Angolan specimens. The Maxwell's Black Weaver type was included in the collection (perhaps accidentally), but its label clearly stated "West Africa". 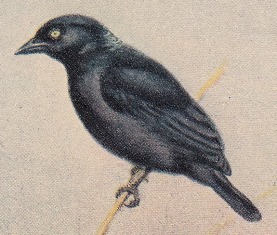 Because of it being with the Angolan birds, many authors incorrectly gave the type locality for Maxwell's Black Weaver as Quanza in Angola but it should always have been listed as West Africa. Unfortunately the type no longer exists, due to a fire in the Lisbon Museum in 1978. 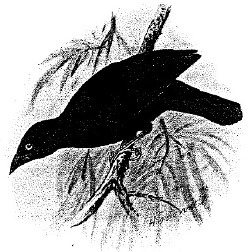 The first illustrations of the Maxwell's Black Weaver were published in Bannerman (1949), the first in colour and of the nominate subspecies, and the second in black and white of another subspecies. 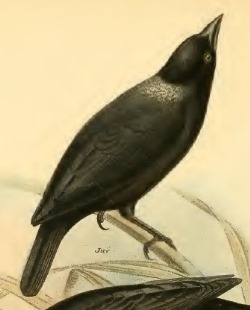 Bartlett (1888) wrote a text on Maxwell's Black Weaver and referred to a plate for this species, but the plate seems to be missing from the book. Sycobius albinucha	Bocage 1876	Jorn. Sci. Math. Phys. Nat. Lisboa, 5, p.247 West Africa. albinucha, Latin: albus, white; Med. Latin nucha, the nape (Arabic nukha, spinal marrow). The White-naped Weaver (Bartlett 1888). Black Weaver, Fernando Po Black Weaver, Maxwell's Weaver, White-naped Black Weaver, White-naped Weaver. Identification. Maxwell's Black Weaver is glossy black in both sexes and the eye is white to greenish-white. The nominate race has white bases to the nape feathers, showing as a pale patch. The juvenile is dark brown above, dull charcoal-grey below, and the eye is brown. It is very similar to Vieillot's Black Weaver, which has a yellow eye (not whitish). The juvenile Vieillot's Black Weaver has a yellow throat and belly, while the juvenile Cassins Malimbe has an orange throat. P. a. albinucha in Sierra Leone to Ghana (see red on map). The adult has a white nape. P. a. holomelas, in Nigeria across to western Uganda (see green on map). The adult has a black nape, and the juvenile is grey below as is the nominate juvenile. P. a. maxwelli, on Bioko Island (see blue on map). The adult has a black nape, and the immature is washed with yellow below. Habitat. 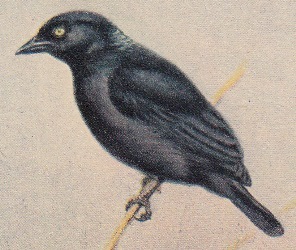 Maxwell's Black Weaver inhabits high forest in Cameroon; elsewhere it is found in the vicinity of villages surrounded by secondary forest, often near rivers and creeks. Maxwell's Black Weaver formst large, noisy roosts in the evening. Food. Maxwell's Black Weaver feeds on insects including grasshoppers, small caterpillars, and chrysalises. It also feeds on fruit, berries, and nectar. It hawks insects in the canopy. Maxwell's Black Weaver forages in mixed-species flocks but single birds may be found high in the canopy. Breeding. Maxwell's Black Weaver is probably polygynous. It is colonial, with 20-500 nests in a colony. It may form mixed colonies with other weaver species. The nest of Maxwell's Black Weaver is a rough hemisphere with the entrance below and almost no tunnel. The nest is constructed of thin, rough creepers, or is woven from strips of banana leaf. The nest is placed at the tip of a branch or palm frond. The nests are usually high up, in the crown of trees. A colony of 20 nests in Sierra Leone was directly below the nest of a Crowned Hawk-eagle Stephanoetus coronatus. The eggs are undescribed and nothing else is known about breeding. Young birds are sometimes harvested by villagers.